Healthy teeth depend on healthy gums. 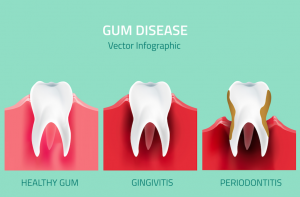 Gum disease is a common condition that ranges from simple inflammation of the gums to significant tissue and bone damage that leads to tooth loss. The following indicators can tell you if you have gum disease. With proper dental hygiene and professional dental treatments, you can manage your gum disease, improve your health, and save your teeth. Gingivitis is a mild form of gum disease. It is an inflammation of the gums caused by bacteria. Bacteria, which are all over the human mouth, can build up with mucus and food particles to form plaque. When plaque hardens into tartar, and you do not go in for regular dental cleanings, the tartar can inflame the gums. With gingivitis, the gums are red, swollen, and bleed easily, but the teeth themselves are usually unaffected. Periodontitis occurs when gingivitis is not treated. Periodontitis is when inflammation occurs around the tooth, and the gums pull away from the teeth. These spaces between the gums and teeth are called pockets and can become infected. Bacteria can enter the bloodstream, leading to an immune response to fight the bacteria. Eventually, the teeth may loosen and must be removed. A dental professional can check your gum pockets to determine what form of treatment is necessary. A tiny probe is used to measure the depth of the gum pockets on the sides and middle of each tooth. If these pockets are between one and three millimeters, the gums are healthy. If you have deeper pockets, the gums may feel tender or painful during this probe test. Pockets deeper than four millimeters often require special treatment. Dental hygiene is a critical part of maintaining healthy gums. Daily brushing and flossing with regular dental cleanings at your dentist’s office can reverse gingivitis. If you smoke, quitting smoking can help improve gum and tooth health. A deep cleaning treatment called scaling and root planing may be recommended for patients with periodontitis. Scaling is when the tartar is scraped from the tooth both above and below the gum line. Root planing is when the bacteria and rough spots on the tooth root are removed. Medications or mouthwashes may be recommended to limit bacteria. In severe cases, surgery may be necessary, and some teeth may need to be removed. It is important to pay attention to your gums and obey recommended oral hygiene practices to guard against gum disease. If you suspect you have gum disease, get your teeth inspected by your dentist. With treatment, you can have healthy gums, healthy teeth, and a natural smile you can be proud of. To schedule a dental appointment with Cosmetic Dentist to the Stars, Dr. Kevin Sands, please call (310) 273-0111 or fill out our online contact form today. This entry was posted on Wednesday, June 28th, 2017 at 1:13 pm	and is filed under Gum Disease. You can follow any responses to this entry through the RSS 2.0 feed. Both comments and pings are currently closed.